Spring cleaning is a huge thing, but I like to do that seasonally...partly because I'm a lunatic and partly because it makes the job easier if you spread it out a bit. So, with the holidays right around the corner, while everyone is hanging their Christmas lights, I'm going through every room in our house and PURGING. Now's as good a time as any. Ben already has too many toys, and toys he's grown out of. His little body is growing at lightening speed so half of his dresser is always occupied by too-small clothes. And I haven't done a clothes purge since I lost my baby belly (ok so it's not COMPLETELY gone, that's not the point!). If you hate getting rid of clothes, and you always find yourself holding on to things just in case, here's a really good tip: keep a big container somewhere in your house for clothes you THINK you want rid of. 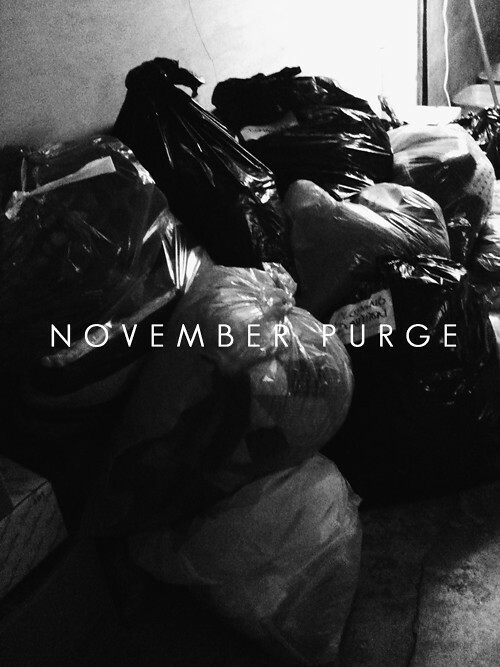 Do your purge and toss your old clothes in there ruthlessly. If you go 5 or 6 months without ever going into it, then pour the whole thing in a donation bag on your next purge (don't even look, you'll talk yourself into keeping it all again). Donating stuff like this is easier these days than ever. I called Clothesline, a Canadian donation program, and on November 30th they will be coming here to pick everything up. There is no limit, you simply label all of your bags or boxes with a big 'D' and leave them at the curb. It couldn't be more simple! Purging is therapeutic for me, and I find I'm way happier when I know that at least some of the junk in our house is gone. Over the past few years I've realized the beauty of less...it started ages ago when I started reading Zen Habits. Are you familiar with this blog? I read it all the time and LOVE it. It's all about living a minimalist life, getting rid of clutter (in your home and life), and finding beauty in simplicity I make a habit of reading every post. And no, my home isn't minimalist or clear of all clutter (I wish) but I like being aware of this sort of thing and making an effort to keep our home free of junk. It's taken a while, but I find that I'm wanting less stuff now more than ever. Oh I still want things, lots of things, but now I think more about my purchases. I talk myself out of buying things sometimes now, and that NEVER used to happen. For example, last year Billy bought me an amazing Coach bag for Christmas. Now, I used to buy a new H&M bag every season (for real), but now I realize how wasteful that is. Wastes my money, and I grow sick of it so quickly (the donation bag full of purses proves it). It's so much better to have a smaller collection of really great clothes (I don't mean expensive, but I mean timeless, like a perfect-fitting cotton t-shirt), than it is to have 10 tops in colours that could only be worn in Spring 2011. How about you, do you love to toss old stuff, or is it a dreaded activity? Any good purging tips to share? I almost get as much satisfaction from purging as I do from buying. I feel like I'm suffocating in "stuff" but I also know in a few months we'll have a lot more space. I think my problem is i'm not organized, everything is everywhere and nothing really has a 'place'. It's true, everyone I know is scaling back and it's so awesome! I can't wait until you have your new space and you can get everything all sorted out, I know it will be amazing!!! Great post. I can't stand 'stuff' but I feel like it's never ending! I'm in a purge mode now at the moment too and I agree it feels good to get rid of it all. You feel lighter. I'm trying to work on the clothes thing as well. My husband always buys good quality clothes (he grew up this way) but I grew up getting the cheap fun stuff and I'm trying to get out of that habit and more into the habit of buying a few good pieces. It's always a work in progress let me tell you! So well said and such a good reminder during this time of the year.